please visit this website it has an amazing wealth of knowledge!! First things first. A 12-volt battery is not a 12-volt battery. 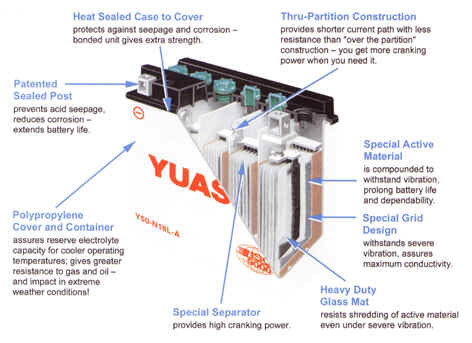 Twelve volts is just a nominal, convenient term used to distinguish one battery from another. A fully-charged 12-volt battery, allowed to "rest" for a few hours (or days) with no load being drawn from it (or charge going to it), will balance out its charge and measure about 12.6 volts between terminals. When a battery reads only 12 volts under the above conditions, it's almost fully depleted. Actually, if a battery's resting voltage is only 12.0 to 12.1 it means only 20 to 25% of its useful energy remains. It's either a goner or it has been deep cycled, and a battery can only be deep-cycled a limited number of times before it is indeed dead. 12-volt batteries supply useful energy only through a limited range -- from over 14 volts (when fully charged and unrested) down to 10.5 volts in use/under load (when lights dim, your motorcycle is hard to start). No 12-volt battery will remain at over 14 volts for more than seconds unless it's being charged. The lowest limit is 10.5 volts (used in testing) and obviously unsatisfactory in practical use. NOTES: Keep in mind that listed voltages are "Resting" Volts. - Top up only with distilled or deionized water, wear gloves and protective glasses. Top up in a well ventilated area, Beware of fumes. - Finish up by testing the battery with either a hydrometer or voltmeter. To extend the service life of your battery, make monthly battery maintenance part of your routine. It's easier than you think to buy the wrong battery for your vehicle. Unless your current battery is definitely the original equipment, you're taking a chance by not double checking before you purchase the new battery. You can search for a certain battery, but there are a few general rules you should know before you search. Never swap a Maintenance Free battery for another battery unless the Applications book says it's OK. When given the option of several different batteries for your vehicle, choose the one that will give you what you want performance-wise. It's up to you.